3 What's with the 'war is peace' stuff? Orb not ejecting? Please see the Checklist for Automatically Ejecting Avatars, particularly the "Disallow by default" option. This is the most common support query for CasperSafe. Depending on your viewer configuration (fonts, UI size, etc.) the length of the option names may not be identical to what's shown here. Popup menus shown here are from Viewer 3. Along with a landmark to the CasperTech store. What's with the 'war is peace' stuff? The orb has been themed in several ways with tongue-in-cheek references to George Orwell's 1984, a novel about totalitarian control, monitoring and mind control. It's not a political statement, just a cultural reference. See the sections below for explanations of all the options. Takes about 20-30 seconds to save configuration changes. Like CasperLet, the script tracks the UUID of the device. New device = new UUID, thus shift > drag > copy = New device and new UUID. When used with CasperLet, the primary tenant + additional subtenants on that rental are added automatically to the SUBADMIN access list. CasperSafe is not meant to be configured via the website - while this may make it less convenient, this does ensure that it continues to function despite any website outage. Because the UpgradeBee does NOT rename the object, if you wish to verify that your orb(s) have been updated, you will need to edit > contents tab > right-click on one of the scripts > select "Properties" > check the version number in the description field. See the versions page for current version number and changelog information. Access main menu - click to see larger version. Subadmin version of access menu - click to see larger version. Admins: This is the owner, plus any additional designated avatars added to the orb's Admin list. SubAdmins: Usually subadmins are the tenants of a landlord. As a result, they will not have access to the options list or other higher administrative functions of the orb. Guest: This option allows you to add a mostly permanent "whitelist" of allowed guests. Guest level does not come with menu access to the orb. Temporary: Like the "Guest" level, except that people added to the temporary list are automatically removed after they leave the sim/region. Each CasperSafe can only hold one set of security options. If you need to have different security settings for different areas, then you'll need one orb per set of security settings. Yes, you can rez multiple orbs on the same sim/region. Two CasperTech support avatars are added to the whitelist to make it easier to provide any needed support: Casper Warden and CasperHelp Resident. Lockdown mode automatically ends when the entire sim is empty of all allowed avatars. Minimum warning time of 20 seconds (default setting of 30 seconds). Lockdown mode warning time of explicitly 10 seconds, regardless of normal warning time setting. Lockdown mode ends automatically when all allowed avatars leave the sim/region. There is no "instant eject" unless the avatar is explicitly on the orb's ban list. 2) If what they think was CasperSafe is actually a neighbor's non-CasperTech orb set to the wrong distance. Visitors normally receive a notice, either by popup or by local chat, indicating what they were ejected by. The CasperSafe Enforcer may ask for permission to return objects. Objects will ONLY be returned IF permissions are granted AND the option to return prims is enabled on the CasperSafe Orb. If activated, the orb will return prims belonging to an avatar when they are ejected. BE CAREFUL with this option - we accept no responsibility for any damage caused. This is the widget that actually does the ejecting / teleport home functions. Thus it is required if you actually want to be able to boot avatars out of the protected area - Otherwise CasperSafe operates in "Warning Mode" which basically nags the avatars instead. Like the CasperLet Prim Counter, in order to function properly, the Enforcer widget must be owned by the LAND OWNER. If the land is owned by an individual, that individual must REZ the Enforcer widget. If the land is owned by a group, the Enforcer must be REZZED by an individual with the same group tag as the parcel, and they must then DEED the Enforcer to the group. If there are multiple land owners, then you will need one Enforcer per land owner. The permissions of the Enforcer widget are copy & transfer so that it can be deeded to the appropriate land owners. UPDATES: The enforcer only needs to be replaced when a new enforcer version goes out. The enforcer will not be able to eject avatars if it is only in your inventory, so yes, the enforcer must stay rezzed. You only need one (1) enforcer per parcel - see the prim counter page for rezzing, when when you have to deed. The enforcer will turn all black when it is properly deeded or rezzed - this is normal and does NOT mean it's broken. Rez the CasperSafe orb first. Then rez and deed the enforcer. If you are using group detection, it is highly recommended that you do NOT use the object return feature, because people will always forget their group tag, and having object return on may result in an individual having their objects returned. All examples are on a per-region basis, and the Enforcer is ONLY required when you need security on an area in a parcel. If you are simply using it for visitor tracking, no enforcer is needed. Even if you have multiple CasperSafes on a parcel for different security settings, you only need ONE Enforcer per parcel. The CasperSafe Enforcer cannot operate across sim boundaries; you will need to repeat the appropriate steps for each sim/region that you have. Right-Click > Edit > "Share with group" > "Deed"
Avatars are tracked by the area they're in. If an avatar is registered as entering two areas at the same time that have identical names, the system will end the first visit to avoid duplicates. Please ensure each area that is defined has its own unique name to avoid this! * When used with CasperLet, the owner and any CasperLet managers are added automatically to the ADMIN access list. * When used with CasperLet, the primary tenant + additional subtenants on that rental are added automatically to the SUBADMIN access list. * Lockdown mode automatically ends when the sim/region is empty of all allowed avatars. If you only want to monitor an area NEAR a skybox, set the orb to monitor a range instead of the parcel. Parcel will assume you want to keep watch over all of the parcel, from "floor to ceiling". If you accidentally manually delete one marker, the corresponding one will self-delete as well. "Object Entry" must be allowed for ALL parcels you are dragging custom markers across. Otherwise you'll see things like particles flying completely out of the parcel, and custom area markers/nodes being automatically returned. Custom Ranges: Number limited only by amount of available memory in the orb. Enter in the detection range, in meters, and click "Send"
Enter name of the area, and click "Send"
Range = Radius. What is a radius? Number of Parcels: Limited only by amount of available memory in the orb. The Parcel Link Tool allows CasperSafe to be paired with one or more parcels. The Parcel Link Tool must be used on the parcel that will be linked to the CasperSafe orb, and ONLY by the owner of the orb. (Admins and subadmins cannot add a parcel using the Parcel Link Tool because the Tool is no-transfer.) This may be rezzed on any parcel and moved over, just be sure to allow a minute or two for it to pick up the change in parcels. Touch me to pair this parcel with your CasperSafe orb. Make sure you have started pairing on the orb by choosing AREA -> ADD -> PARCEL, first. I'm now over parcel ((parcel name as seen in "about land" floater)). Touch to register with a CasperSafe Orb. OK. Trying to find a CasperSafe orb, please stand by. 7) The Parcel Link Tool will self-delete when the parcel pairing process is completed. Pairing process usually takes 1-2 minutes, but may be longer if the region is heavily lagged. NOTE: CasperSafe may be paired with only ONE rental unit. If you have multiple rental units out, AND you want to pair CasperSafe to the units, you'll need one CasperSafe per unit. Default main menu - click to see larger version. Okay, let's have a look here..
Ooh, CasperLet! Good choice! Searching for the orb..
6) The orb will also add the CasperSafe system owner as an ADMIN automatically. CasperSafe will automatically pick up changes to CasperLet managers, HOWEVER it is not instant - It will take time to filter through, and will be the next time the rental unit updates info to/from the server. By default, when you first rez out CasperSafe, the orb is in the "unarmed" state. When unarmed, the orb automatically runs in "discreet mode" in order to be kinder to region resources. Armed mode - click to see larger version. When CasperSafe is armed, the base menu will also show the option "Lockdown" - this changes the warning time to 10 seconds (reduced from the normal minimum of 20 seconds), and increases the scan frequency in order to detect possible threats more quickly. Also, when someone arrives who is not on any of the access lists, admins will get a popup asking them if they want to add the new arrival on a temporary or guest basis, or whether to ban. If the orb is currently in "lockdown" mode, the lockdown option will change to "stand down". This automatically disables itself when everyone ON the access list has left the sim/region - there is no time limit beyond that. Lockdown mode changes the warning time to 10 seconds (from the normal minimum of 20), and uses slightly more script time than normal operation (see Script Times for details) in order to detect possible intrusions faster. Default Options page 1 - click to see larger version. Default Options page 2- click to see larger version. Floating Text This turns the radar on and off. Having the radar on will use more script time and processing. Disallow by default When on, this will eject anyone who's not on the access list. Discreet mode When on, this slows down the timers to reduce lag. It won't be as responsive, but it will be kinder to region resources. Eject from parcel When on, this will eject unwanted visitors after the warning period has ended. Teleport Home When on, this will teleport unwanted visitors to their home point. Add to parcel ban list When on, this will add ejected avatars to the parcel's land ban list (not the ban list in the orb). Warning Time This controls how long the avatar can stay before being ejected, if eject mode is on. In "Warning mode" (which is the default, if there is no Enforcer present and/or properly deeded) this is how long before CasperSafe sends another warning to the intruding avatar. The shipped default is 30 seconds, and may be reduced to 20 seconds for normal operation. When in lockdown mode, the warning time is hard-set at 10 seconds. Age Limit When on, you configure the minimum number of days of account age before avatars are allowed in to the protected area. 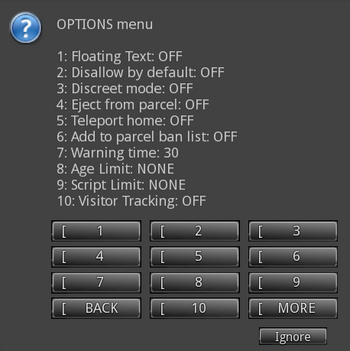 Script Limit When on, you configure the maximum amount of scripts an avatar may be wearing/using before they are allowed in to the protected area. Group members are guests When on, allows members of the group the orb is rezzed under into the protected area. "Guest" access does not include any part of orb menus. Group members are subadmins When on, allows members of the group the orb is rezzed under both into the protected area and gives them subadmin access to the orb itself. Limit detection to current parcel When on, this limits detection ranges to within the borders of the parcel the orb is rezzed on. This prevents things like the orb's ejecting/banning from affecting users on other (unrelated) parcels. 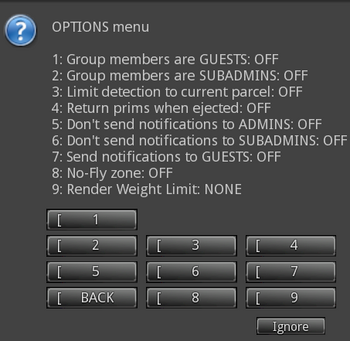 Return prims when ejected When on, uses the scripted prim autoreturn feature. This is not recommended in combination with group detection, because people often forget their group tag when they try to rez objects. Send notifications to guests When on, this will send notifications to users on the "Guest" access level. By default they don't receive notifications. No-Fly Zone When on, the flying avatar is warned. If "Eject" is on, then the user is ejected from the area. If "Teleport Home" is on, then the user is teleported home. There is no height limit on flight detection. Render Weight Limit When on, you set the maximum avatar complexity that individual avatars should be at. Users above that point will be warned. If "Eject" is on, then the user is ejected from the area. If "Teleport Home" is on, then the user is teleported home. Data about names for Admin/Subadmin/Guest lists are stored IN the device. Consequently every name that's added will cause the available memory to decrease, and it will give you a local chat message indicating how much memory is left. Once the available memory gets below a certain point (somewhere around 300 names), the orb will crash - so it's up to you to keep an eye on how much memory is being used. You CAN rez multiple orbs if you are getting low in memory on the first one. It is not the same thing as avatar complexity, but represents the same thing. It has a maximum value of 500,000. If you set your limit higher than this, it'll have no effect. A render weight of 500,000 is roughly equivalent to an avatar complexity of 1 million. Render weight is calculated by viewers, not the simulator, so it will only work if there are other people nearby. Please understand that this is not a predictable or reliable figure, it can vary based on many different factors, and can suffer from random "surges" with apparently no cause. For this reason, we do not recommend that you enforce a render weight limit. However, the option is there if you require it. We've opened a Jira ticket to request script access to avatar complexity. Vote if you want this feature! Is the Enforcer rezzed out by the land owner? Is the enforcer ON the parcel? If it is group land, is the Enforcer deeded to the group? Is it multiple parcels - and is there one Enforcer PER PARCEL? Under Options > Disallow, did you turn "disallow by default" to ON? Has the avatar to be ejected been standing still BEFORE you turned on "disallow by default"? Once the avatar moves, they will be seen and ejected. If they stand still and don't move, they won't be ejected yet. If you have the CasperSafe set to only allow group members, your group members MUST ALREADY be wearing the group tag when they teleport in. CasperSafe will not recognize if they change tags once they arrive - they'll have to tp out then back to get the orb to see the proper group. Visitor data WILL be sent to CasperTech servers when turned on. When visitor tracking is enabled, the "VISITORS" button will change to "CNTRL PANEL" - click the control panel button to get a link for the web-based visitor stats. Visitor tracking does not require land ownership. You can rent in a mall and still track your mall store visitors. Every time an avatar enters or leaves an area (and visitor tracking is turned on), the orb must send a message to CasperPanel to let it know. It is expected that - from time to time - one of these message may be lost/dropped, which will either cause a missing visitor, or a visitor remaining visible who has really already left. This is normal and expected, from time to time, however it shouldn't happen too often. If you are experiencing this problem very often, please contact CasperTech support since there may be something wrong that we need to look at. You can fix this by resetting your orb. Your "current visitors" list will also be cleared when the region restarts. There is NO linking process required to hook up CasperSafe with CasperVend - this is automatic behind the scenes. If you have visitor list enabled, you will see icons that represent repeat visits, and whether they bought something on that visit. If you simply don't want the "war is peace" strip to change, there is a notecard in the shipping crate labeled DISABLE_TEXTURE_CHANGE - simply drop that in the orb's contents, and it will disable further color changes to that strip. Alternately, you can rez a simple prim sphere and copy all the contents of the orb to that - an unmodified legacy prim sphere has only face #0. NOTE: Currently, the "Disable texture change" does NOT change the texture animation. Please keep that in mind when making a custom object. If you want the notifications for your staff to arrive as an object IM instead of a llRegionSay message (so they can potentially reach your staff when they are not in the sim/region) then simply drop the script labeled Optional Plugin: Send IMs to staff into the orb object, and it will do the rest. The optional plugin script is open source - therefore any changes you make to the script are your responsibility, and are unsupported by CasperTech. You cannot turn these off at this time, but that functionality is expected to be added in the next release. We haven't yet published the API for CasperSafe. There is currently no date for when the API will be released. When it is released, it will be inserted into this space. If you are still seeing THIS message, the API information has not been released yet. All configuration of the orb itself is done inworld. While it stores minor configuration information online as a backup, it is designed to stay functional even if CasperTech web services have issues. The new copy will lose all configuration due to a new UUID created which has no record on the database. You may, however, take a copy of an orb with the desired configuration and rez as many additional copies of that as you please. Access level of the avatar is not sent with the visit statistics. While the orb can track multiple areas and parcels without an issue, it is only designed to hold ONE set of security settings. You cannot choose to eject people from one area while not ejecting them from another - you'll need multiple orbs. Yes, you can rez multiple orbs on a parcel and a sim/region. llAddToLandBanList only works for the parcel the enforcer is currently on. If the land is group owned, the Enforcer unit will need to be deeded, using the same process as if you were deeding a prim counter. If you delete an area, any avatars shown as currently visiting the area on the website will not be removed until the next time the orb is reset or the region is restarted. CasperSafe does not support any sort of avatar height restriction. Since the introduction of mesh avatars, you can no longer depend on avatar height as being a psuedo-reliable indicator of the avatar's "age". There are many non-child avatars that are also short, and non-human avatars can come in many sizes as well. Height restrictions are therefore irrelevant today, and would eliminate too many legitimate avatars. CasperSafe is designed to be fair to all. Security devices which are set to less than 10 seconds do not provide ample opportunity for passer-bys to vacate the area voluntarily - for the above reason, we don't support an "instant" eject mode. However, those who are on the "Ban" list will be ejected instantly. CasperSafe is only set up to eject in response to an allow prompt. These timings were measured over a 24 hour period, on a relatively quiet full region (Izanagi). Your mileage may vary, and times may be higher on busy sims. "Script asking non-owner for run time permissions only owner can grant"
This is only referring to the scripted autoreturn permissions. They can only be granted by an OWNER in the land group. All other functions of the enforcer are unaffected by granting - or not granting - the autoreturn capability. ChangeQueue is full! Too many events to send to the server! Casper needs to debug that. Please file a ticket and leave the orb out where Casper can access it. Q. I'm seeing (one or more of) my managers get removed from the orb, but when I list the admins, they're still showing on the orb's list. A. CasperSafe clears the list and re-adds them each time it is reset - this is part of the reset process. It is supposed to silence these messages, but sometimes (due to grid things) the messages are processed out of sequence and the remove message is processed before the silence message. This page was last edited on 29 November 2018, at 11:59.